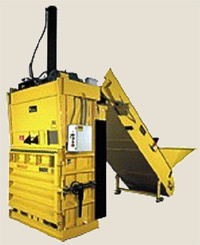 Smaller, mobile balers are available for applications with lower volumes of scrap. These machines are ideal for customers who have limited space or a need for smaller-sized bales. Portable balers produce bales of cardboard, plastic, clothing, cans, bottles and other materials weighing up to 140 lbs.The M-30 STD is ideal for baling recyclable materials such as; corrugated cardboard, PET plastic, shrink wrap, steel cans, and aluminum cans. These machines are often used in convenience stores, office developments, motels/hotels, hospitals/nursing homes, restaurants, drug stores and many other industrial/commercial applications. The M-30 STD mini baler makes a non-mill-size bale of corrugated cardboard weighing up to 220 pounds. Rear-chute fed auto-cycling models offer many features of more expensive horizontal balers but at a lower cost. With a conveyor-loading system, these versatile balers save labor and preparation time, allowing you to produce heavier bales in less time. High compression force and extended cylinder penetration produce a much higher density bale. The high-density Ten Sixty combines the versatility of a downstroke baler with the productivity and the bale density previously achieved only by large two-ram horizontal balers. 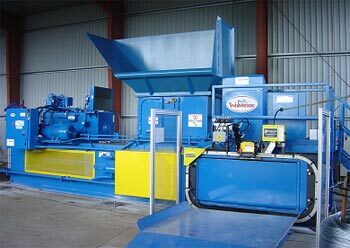 These balers can be configured with a conveyor as a unique rear feed baler for use in high capacity applications as well as a simple front feed system when space is at a premium. Using the rear feed system, steel and aluminum cans, plastic bottles and newsprint can be simply dumped into a conveyor hopper. 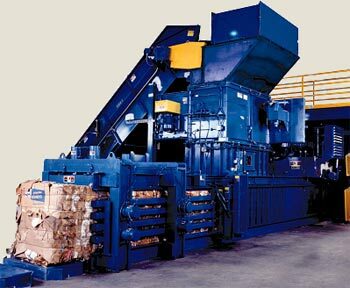 The recyclable material is then conveyed into the baler and automatically compacted into very dense bales. When the desired bale height is reached, the baler shuts down and signals the operator to tie-off and eject the bale. The heavy-duty construction extends to every aspect of the machine including the ejector system which smoothly ejects bales weighing over 2,000 pounds. Horizontal balers combine the efficiency of automatic cycling and continuous operation with the capability to operate with mechanical feed equipment to provide for lower cost material processing. Horizontal Closed-Door balers are suited for applications ranging from a couple bales per day to several bales per hour. Standard hoppers are Ideal for automated processing of smaller sized pieces of a variety of materials including shredded and trim scrap. These balers accept feed from mechanical devices including conveyor belts, air conveyance and cart dumpers. The machines incorporate a photo-eye to cycle automatically. 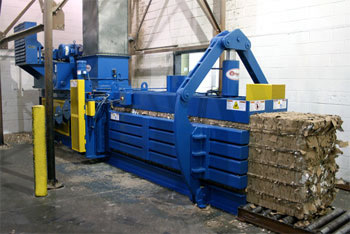 Various models are available to produce smaller bales or "mill size" bales. These large hopper models are designed to accept bulky materials such as large cardboard boxes. 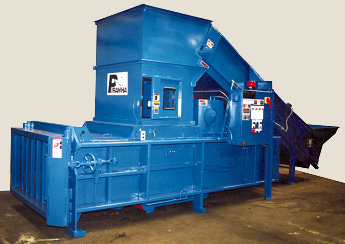 With a large feed opening, powerful hydraulic ram, and heavy-duty serrated shear blades, wide mouth balers quickly reduce mountainous piles of scrap into dense, stackable bales weighing up to 2,200 pounds. A full-eject baler provides the ideal solution when you need the flexibility to bale a wide variety of products in a single machine. Multi-material balers offer the convenience of conveyor-feed and auto-cycling in a compact footprint. 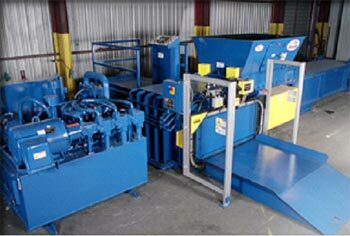 Non-ferrous balers are for applications requiring an efficient means of processing aluminum, tin, steel, extrusions, clips, radiators, and other non-ferrous metals into dense, square bales. Non-ferrous balers feature rugged structural construction, large feed opening, machined shear blade and abrasion resistant wear liners. 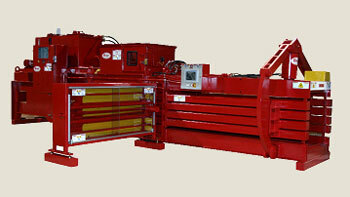 We also offer a variety of balers for specialized applications. For applications baling scrap metal, textiles, foam, E-waste, printer's waste and many types of industrial scrap. Contact us to discuss your specific needs! Open-end auto-tie balers fully automate bale production by automatically tying each bale to provide lower operating costs. Various hopper dimensions, compression forces, power units and feed options are available to allow you to select a model based on the density and volume of your waste stream. Medium to high production models can handle most materials. Narrow box auto-tie balers are specifically built for baling shredded, trim, skeletons, die cut materials, and other various grades of waste paper. 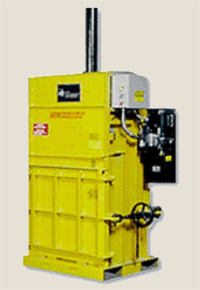 They are designed to perform in conjunction with shredders and air systems. 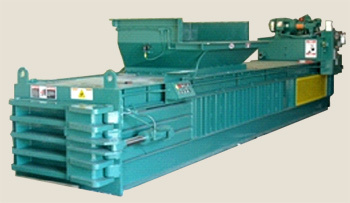 Narrow box balers are often installed at printers, box plants, converters and document destruction companies. High density models are available for baling plastic bottles and film, aluminum and bi-metal bans, foam and other materials. 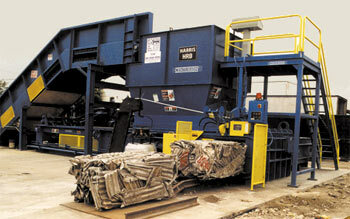 Wide mouth balers have larger hopper openings to quickly bale corrugated cardboard and other grades of paper. Controls allow easy adjustment from grade to grade. Wide mouth auto-tie balers are well suited for applications at distribution centers, recycling centers, manufacturing plants, warehouses and box plants. High-performance models are available for customers with demanding applications. These machines incorporate the latest structural enhancements for strength and durability, energy-efficient hydraulics, advanced user-friendly touch-screen operational controls with multiple material settings and high-speed wire-tie assembly. Two-ram balers provide the most efficient and versatile means for high-volume processing of multiple materials. Dozens of models offer the capability to process a wide range of cardboard, paper, plastics, cans, non-ferrous, solid waste and other materials. Looking for the versatility and automation of a two-ram baler at an affordable price? Smaller models are available for operations that don't require high processing rates, but still need to automatically process multiple products into dense, stackable, high quality bales. 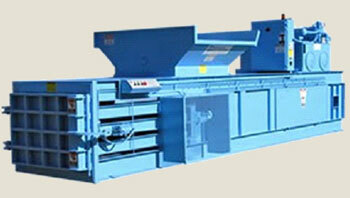 Narrow box balers are multi-purpose automated two-ram balers with all the features of larger machines. 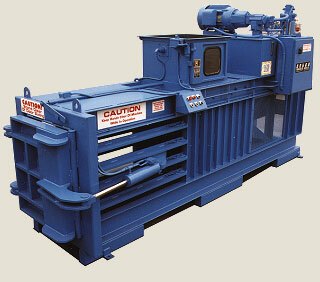 Narrow box models offer charge openings up to 85"x42" and processing rates over 30 tons per hour. High-quality components and advanced design are packaged with user-friendly features such as the Combo-door, Smart-knife shear blades, abrasion resistant wear surfaces and state-of-the-art OIT controls. 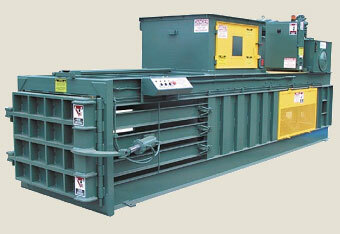 Wide box balers are designed for high-volume material processing with easy operation and simple maintenance. 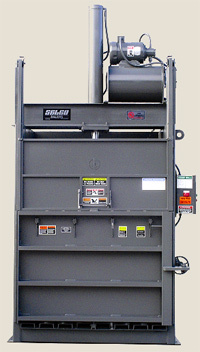 Models with large feed openings have been the workhorse of two-ram baler design for decades. The latest technologies have been incorporated into improvements in structural design, hydraulics, controls and features. Maximum compaction densities provide ultra-dense bales for maximized payload. ©2016 DeHart Recycling Equipment Inc.